The creators of the Bitcoin-style currency say their company name refers not to the rapper but "to a half-man, half-fish hybrid." The story of cryptocurrency company Coinye is becoming increasingly bizarre with each passing day. Launching on Dec. 7, the company originally called itself Coinye West and used a coin with the image of a Kanye West lookalike as its logo. To nobody's surprise, the company quickly found itself the target of a cease-and-desist letter from the rapper. The company's response? Fire off a cease-and-desist of their own. 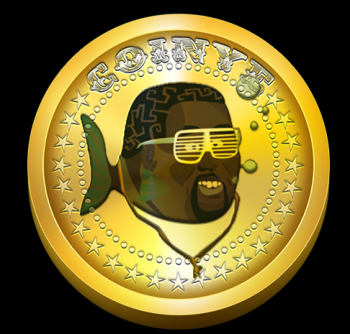 According to Coinye, West and his lawyers have been engaging in scare tactics among the Coinye community, which they say is not infringing on the musician's image with its new logo, the man-fish monster shown at right. In a letter sent to West's attorney, Coinye states that "we make no visual or verbal reference to Kanye West but to a half-man-half-fish hybrid who is wearing sunglasses, again, totally separate from any resemblance to your client." Further, the company has "removed any and all references to your client which we feel could mislead someone in to believing that there is in any way a link between the two," Coinye stated. Coinye's claims are pretty tough to swallow, and it's hard to feel that they're not just taking some extra shots at West. He and his lawyers definitely aren't joking, though, as they've already warned that they could pursue legal action against anyone who uses the currency. We've sent an email to West's lawyer, Brad Rose, for additional comment.